Having a reliable electrician handy will help you maintain the health of your electrical system easily. Sure Line Electric has years of experience tackling a plethora of electrical problems as well as installing new electrical wiring and panels in the event that your home needs increased electrical activity. All of our electricians are highly trained and licensed to practice in Oyster Bay and surrounding areas so you can rest assured that you are in capable hands when you need us. We constantly update our equipment and train our technicians to be able to keep up with the ever improving technological world that controls how modern appliances use electricity. Give us a call whenever you need electrical assistance and we will be glad to assist. It is inevitable that some time in the process of owning a home that you will encounter electrical issues, especially in an older home. The slightest thing can throw the whole system off balance and more damage done if left untreated. 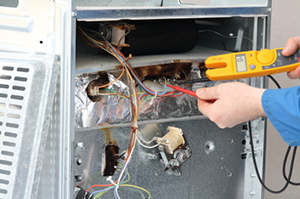 Our technicians will help you diagnose the cause of such issues and do everything in their power to help you repair them efficiently so you aren’t inconvenienced. We are trained and licensed to handle all types of electrical repairs so don’t hesitate to give us a call when you are in need of assistance. There are several reasons for you to need a panel upgrade. The most common reason is that your panel cannot keep up with the load necessary to run all of your appliances. Technology has advanced so quickly in the past few decades that it is hard for your electrical system to keep up. A good telltale sign of this is if the circuits housed in the panel keeping flipping off. Another reason is because you’ve recently added on to your house. Each panel can only house a certain amount of circuit breakers and each bit of electrical wiring in your home needs to be hooked to a breaker for safety reasons. When you run out of circuits, you need to get more, which is where a panel upgrade comes in handy. An electrical inspection is most commonly needed when buying or selling a home but that is far from the only time you should have one. It has been recommended that at least once every three years you should get your electrical system thoroughly assessed but in older home, it is needed more often. In fact, if you suspect your electrical system is subpar, you have us take a look to identify any problem areas that need to be addressed. Give us a call to learn more about our Town Of Oyster Bay services or to schedule an appointment at 631-240-9663, or fill out our request service form.